So, before I start I just wanted to share this with you all.. I was settling into bed with my Mac about to write this post when my leg brushed up against Mr Wobbles (dont worry this is pg rated), there was an insane amount of static which felt really weird so we kept "staticing" each other with our arms and legs then we stopped for a little while and when our elbows touched we both got a massive zap! How weird is that??!?! We both were on our Mac's .. wonder if the laptop emits some sort of electricity which then created a current between us hence the zap? Has this happened to anyone else before? Surely cant be good if the laptop is emitting this "free electricity"? ... anyways, sorry enough physics already. 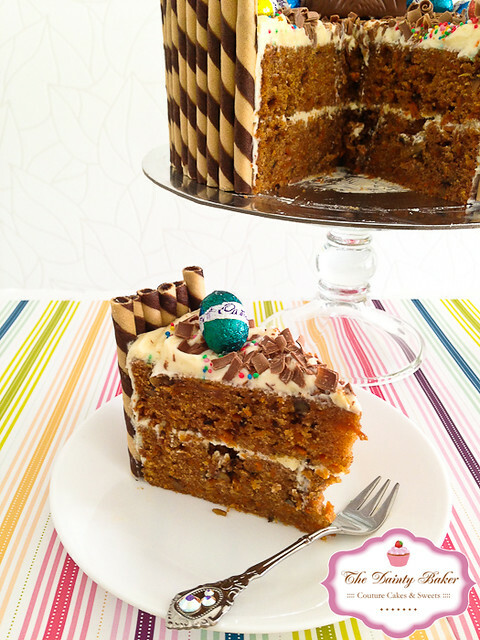 My post today includes a recipe and tips on how to make a quick and easy Easter Cake! I haven't done a recipe in a while so thought this would be a good one to share. 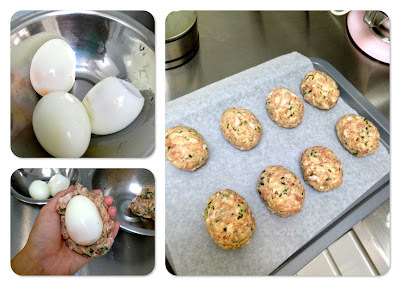 I attempted to make Scotch Eggs the other day. 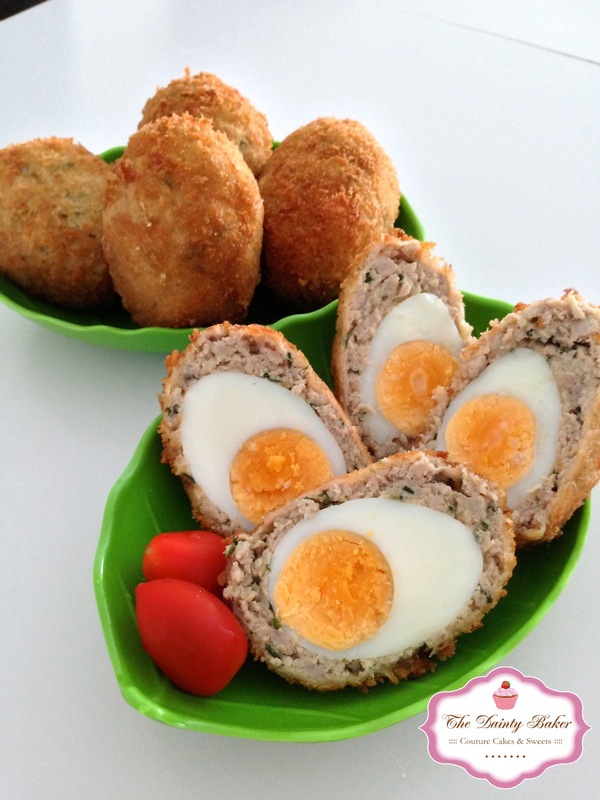 What is a Scotch Egg? (Thats what I asked when Mr Wobbles mentioned it to me) Its an egg thats incased in sausage meat, crumbed and fried. I have never heard of it and have never had it before which was why I decided to make it. 1. Place 8 eggs in a pot of cold water. Bring to the boil then reduce heat and simmer for 2 mins. Remove from heat and place eggs into iced cold water. Set aside. 2. Remove the sausage meat from the casing. 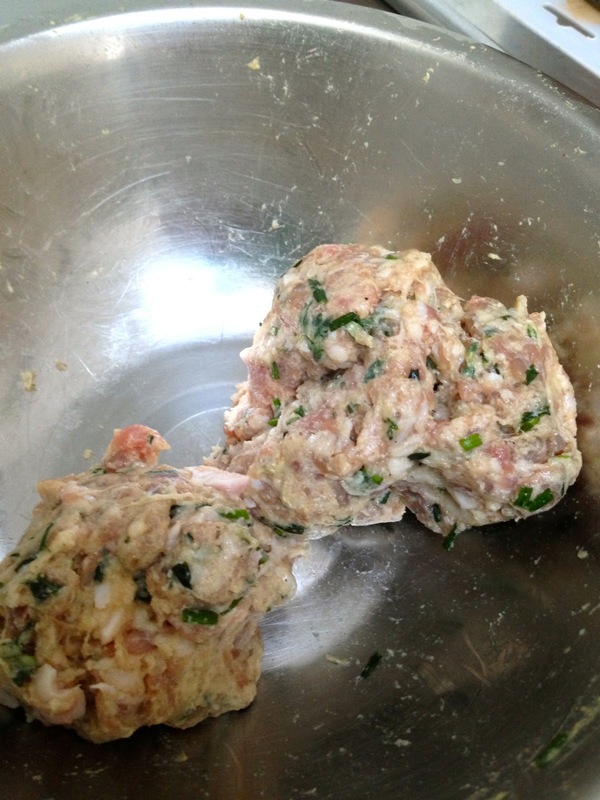 Add herbs and mustard then mix until it comes together evenly (do not over mix). Divide the mix into 8 patties. 4. 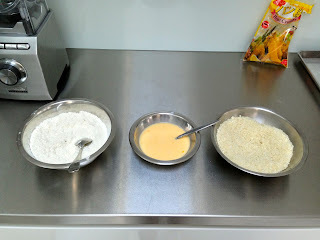 In 3 separate wide bowls, place the flour (seasoned with salt and pepper - go easy on the salt), then whisk the remaining egg with the milk in another bowl. The last bowl will have the panko crumbs. 5. 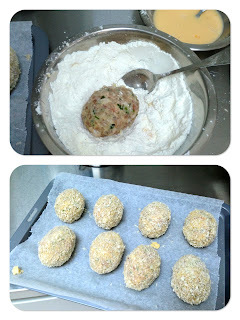 Roll the eggs in the flour first, then the egg/milk mixture, lastly the panko crumbs. It's easiest if you have a spoon in the egg/milk mix to help you turn over the egg. Chill for 15 mins. 6. Preheat oven to 170o C.
7. Place enough oil in a deep wok or pan to fill at least half way. Heat the oil up to 190o C, the crumbs should fry instantly. Deep fry the eggs in batches of 2 (you may need to flip it over if the oil doesn't cover the egg entirely) until golden brown. 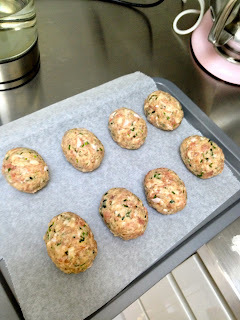 Place on a tray and bake in the oven for another 10 mins or until meat is cooked. When done place on absorbent paper to remove excess oil. 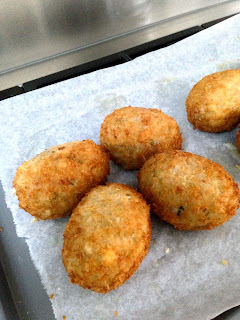 Serve warm or cold, with mustard or tomato sauce. On the sweet side (I couldn't write a Dainty Baker post without something sweet) here is a quick little cute Easter cake I made for this weekend. This is a quick "premade" cake that you can whip up in a few mins (depending if you already have the cakes baked and cooled). Guaranteed to wowsers your family and friends! 2 x 8 inch cakes (or what ever size you want) baked and cooled. I didn't use a pre-made cake already bought as I baked my moist carrot cake the night before. Icing/frosting - Cream cheese frosting in this case. 1. Just ice your cakes and stack. Then place the wafer cigarettes around the iced cake. 2. Using a peeler, "peel" curls/shavings of chocolate from the block of chocolate. You need to be gentle and not push too hard. 3. 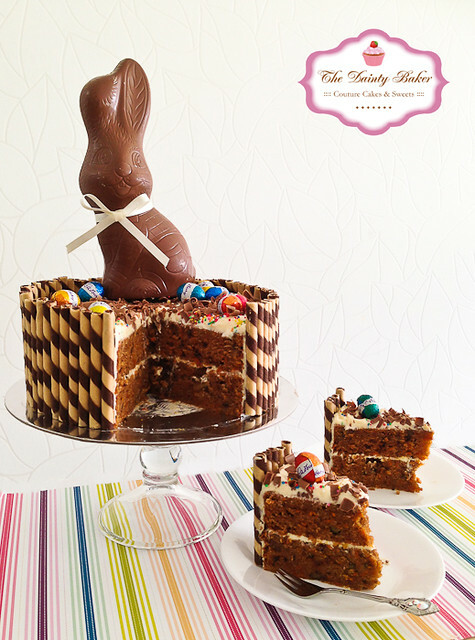 Securing your bunny - Push one skewer into the cake, mark where the top of the cake is. Remove skewer and cut the skewer where the mark is. Use this as a guide to cut 3 more of the same size. Depending on how high your cake is you may need 1-2 skewers. Arrange these in the cake so that they will support the 4 corners of your bunny to sit on. With the remaining skewer, carefully push/twist into the middle of the underside of the bunny. Place a generous dab of icing in the middle of the 4 skewers already in the cake. Then place the bunny with the skewer in it into the cake. 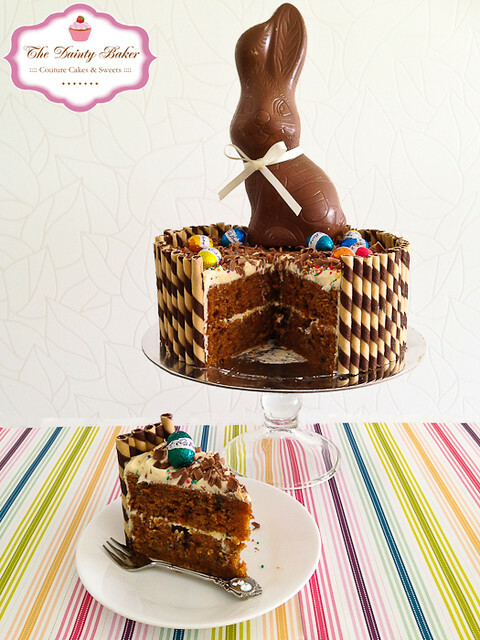 The 4 skewers will ensure that the bunny doesn't sink into the cake and the large skewer through the middle will ensure that the bunny doesn't topple over. 4. Scatter the easter eggs and 100s & 1000's over the chocolate shavings. 5. 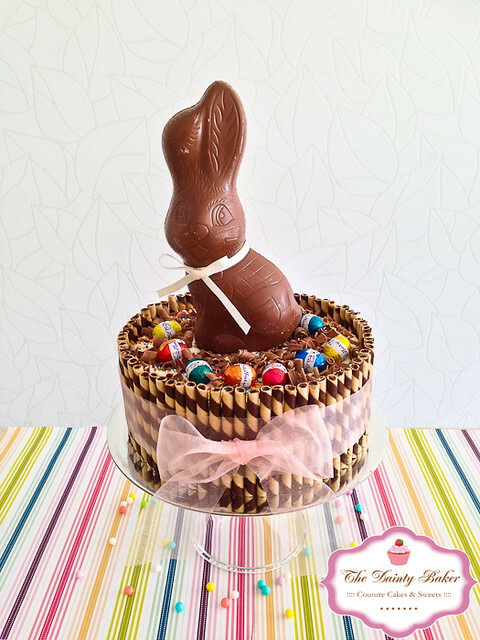 Finish by placing a bow around the whole of the cake and around the bunny's neck. Wishing everyone a CHOCOLATEY, FANTABULOUS & SAFE EASTER!! !